CDR Andy Newsome is an Information Warfare Officer, and is passionate about helping others. Andy is a graduate of the U.S. Naval Academy, Naval War College and Naval Postgraduate School. He has served and led in various capacities inside and outside of the Navy. Andy loves spending time with family, classic cars, serving in the community, and camping with his sons and fellow Scouters. Canoeing is one of my favorite activities. I love being on the water (a good thing since I chose to serve in the Navy). The lake where I’ve been spending some time lately is small, and I’m usually the only person on the water. While I typically enjoy canoeing with friends or family, every once in a while I like being by myself. I’m an only child, so I have plenty of experience being alone. I don’t like being by myself all of the time (I would consider myself to be extroverted), but I do enjoy solitude from time to time. I’d like to think that being an only child has made me a bit of an authority on the benefits of solitude – especially as it pertains to leadership. Solitude permits you to enjoy the beauty of Nature. You don’t have to be outdoors to derive benefit from solitude, but I certainly love being outside every chance that I get. It’s one reason my sons and I love the Scouting program. No matter how you think we all got here, you have to admit this rock we’re riding on is beautiful. Being alone in Nature allows you to focus on its beauty. That focus can help to foster an attitude of gratitude, and gratefulness is a key trait of a good leader. Solitude can have a calming effect. Let’s face it – our lives are fast-paced. We’re over-stressed, over-scheduled and over-stimulated. Henry David Thoreau wrote “I think that I cannot preserve my health and spirits, unless I spend four hours a day at least – and it is commonly more than that – sauntering through the woods and over the hills and fields, absolutely free from all worldly engagements.” Today we’re unlikely to be able to spare multiple hours per day in solitude, but getting alone from time to time can have a calming effect on our bodies and minds. As leaders, we need to be able to maintain calm, especially in the face of adversity. Our followers might initially respond to – but won’t respect – a hothead. They want to know that their leader can remain calm when the going gets tough. Solitude can help you think more clearly. Being alone, absent from distractions, can help you sort through your thoughts. As leaders, we often deal with complex issues or dilemmas, and extracting ourselves from a hectic environment can help provide the clarity and focus required to make good decisions. While it’s important to seek out the counsel of others, it’s just as important to process our own thoughts, beliefs, biases, and assumptions. Leaders need to be able to think for themselves, which means that they need to be by themselves from time to time. Get up a bit earlier in the morning (before everyone else in the house). Why not start the day with some solitude? It’s a good time to do some reading, light exercise, meditation, affirmation or journaling. Brew some coffee or tea (or hydrate with water), and enjoy some peace before your day gets hectic. Push away from your desk! If you’ve been staring at the computer screen too long, take a walk! If it’s decent weather, go outside and soak up some sun. It’s a great way to quickly recharge in the middle of the workday. It might also help you reach a mental breakthrough on a work-related problem. If you make an effort to be alone from time to time, you will experience some of the benefits described here, and maybe even more. You will also improve in your role as a leader. I recommend this essay on Solitude and Leadership to you. How and when do you prefer to get solitude? Where do you go, and what do you prefer to do? 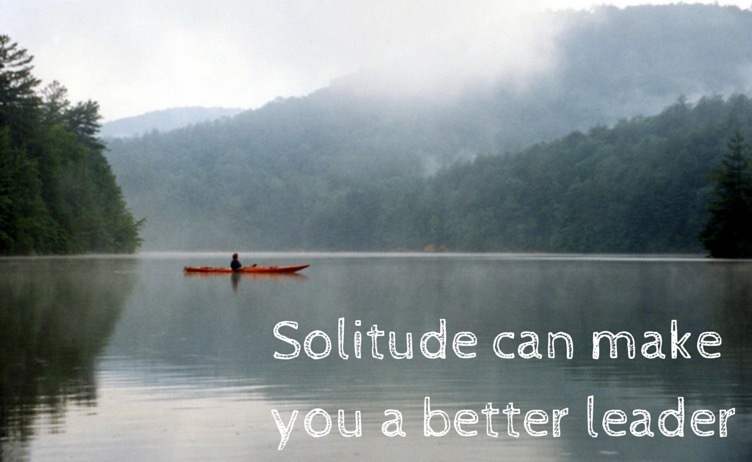 How has solitude helped you as a person and leader? So it brings me great pleasure in seeing this post. So much of our life is connected. Whether it be physically, emotionally, or digitally. The ability to seek solitide and clear the mind while solving the intricate problems we deal with is something profound. The human brain is utterly amazing. Seth – Great minds for sure. To be clear, the great mind behind this post is not me, but our good friend Andy Newsome. Great points Mario – sounds like some more good post topics!